This particular example is made by Radford Dale in South Africa’s Stellenbosch, a region better known for its dense, concentrated reds. I’m rather more taken with this fun, characterful wine than I am with many of the region’s more ‘serious’ wines. 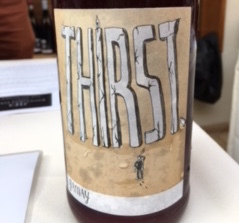 Its pretty dark pink colour hints at its brightness and freshness, and it has some of gamay’s typical red berry fruit, as well as a hint of herbaceousness. It’s not the most complex wine you’ll ever taste, but you’ll be damn glad to find you’ve put a bottle in the fridge for an hour before you tuck into a charcuterie platter and salads – or even a bit of grilled fish. Fun, isn’t it?